Git is a very advanced and powerful version control system. It supports too many features and it’s difficult to remember each and every command unless you are a heavy Git user or a Git dev yourself. I try not to remember too many of them. However, Git is used best when it is used from the cmdline. And in my experience, there are a few commands that are used much more frequently than others. I will list those in this article to have a reference for myself as well as for others. In the examples I will use GitHub’s own Atom project repository link for the examples. Before I begin, here’s a good practice for a Git dev – always have a clean master branch checked-out from the original project’s master branch. Make your changes to a separate development branch and rebase your master and dev branch regularly with the main project branch. In other words, your changes should go into the project’s master branch from your dev branch. Those changes are then pulled into your master branch. $ git config --global user.email "your-email@provider.com"
Use GitHub’s web interface to fork your own master branch from the project’s main branch. Clone your mater branch locally. In case of very old or large repositories, you can do a shallow clone by fetching history of only latest n commits. Add the original Atom project as upstream. Use the GitHub web interface to create a new branch named dev. This is where your own changes should go first. A few words of merge and rebase first. Rule of the thumb is – use merge/rebase when you have no changes in your local dev branch. Both result in same commit history. However, if you have changes in your local dev branch but would like to get the changes in remote as well, then use rebase for a clean commit history. $ git commit --amend -m "New commit message"
Tags are baselines you can revert back to in the future. $ git tag -a tag_name -m "your message here"
Another useful list is the giteveryday man page. Feel free to suggest if you think I should add any command to the article. To install FreeFileSync on Ubuntu, download the packages from the downloads section. ungit: the easiest way to Git! Git is a very advanced version control system and using Git can be tricky if you are new to it. ungit is a great aid in spending less time in learning Git than in actual development. It is a web-based application that uses node.js. IMHO it is also a very helpful utility to learn Git visually first than jumping into the cmdline with Git. The video above gives a quick overview of how ungit can help you stay off the cmdline to use Git. The visual representations of the probable actions are simply brilliant! ungit is multiplatform and tightly integrated with GitHub. It has a plugin based architecture so it can be extended easily to support other source control services those support Git. You need node.js, npm (comes with node.js) and git to use ungit. Necessary instructions to use ungit are given in the ungit GitHub page (link below). Posted on May 2, 2014 Categories HACKS/UTILSTags git, scm, version controlLeave a comment on ungit: the easiest way to Git! I was looking for a good GUI based Git repository browser to view changes. To speak the truth, the terminal is not really the best option to look at a overwhelming number of change records which need to be examined in detail and in reasonable time. There are many Git GUI interfaces on Linux but some of them are bulky and some lack finesse. I found QGit to be exactly the tool I needed. Very lightweight. Written using Qt/C++. 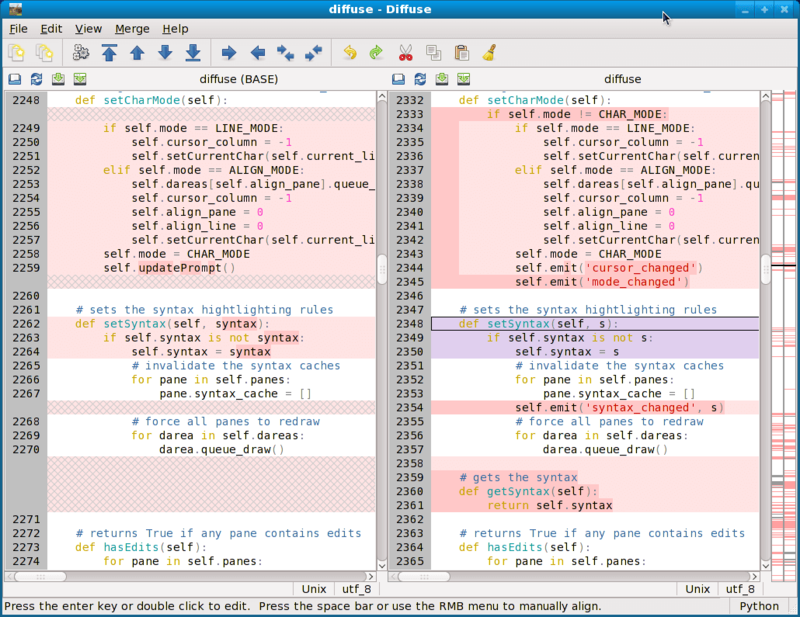 QGit integrates seamlessly with Diffuse, a graphical file diff viewer. Diffuse is one of the few diff-merge tools that supports N-ary file merge. However, one of its most powerful features is the support for version control systems. Diffuse is written in Python. If you are related to Linux development, you probably have heard of Git already. It is a powerful and widely popular version control system. The Linux kernel project is managed using Git. Git does not have any GUI of its own and needs to be accessed from the cmdline. SmartGit/Hg is a multi-platform (Linux, Windows, Mac) GUI client for Git and Mercurial (Hg). It is simple to use, has powerful features and comes as a bundle that packages utilities like SSH, FTP etc. so that you do not need to install anything separately. As you can see from the above image, the interface is pretty attractive as well. SmartGit/Hg depends on the JAVA runtime environment. Click on the Files tab and now you can browse your newly created repository, view diffs, changelogs and everything. How cool is that? Navigate through the documentation to know more about Fossil. You’ll be surprised what you can do with it. Chisel is a service offering hosting for unlimited Fossil repositories.